This is an excellent, well-researched,very pointed and MUST-READ article by Bruce Bartlett, published in the Economix column of the NYT. via Bruce Bartlett: ‘Financialization’ as a Cause of Economic Malaise – NYTimes.com. Bartlett “held senior policy roles in the Reagan and George H.W. Bush administrations and served on the staffs of Representatives Jack Kemp and Ron Paul“. Personally, I think that Bartlett has a point and his argument is even more valid for the UK, which is more dependent upon financial services than the US. 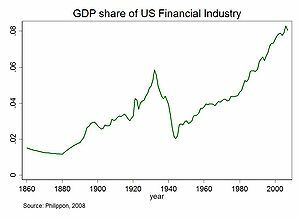 For me the current explosion of financial services and subordination of real industries, can be traced back to the liberalization of the financial services industry in both the US and the UK. This led, via greed, to the financial crisis of 2008. Since 2008, world leaders have focused on greater bank regulation but have been ineffective in getting the financial sector to lend more to help traditional industries grow. For those interested in a more detailed analysis open this link which contains one my earlier blogs on neoliberalism which provides the intellectual basis for economic liberalism and deregulation. Based upon my political beliefs, I still think there is hope for a more compassionate neoliberalism often called Third Wave Neoliberalism. Any thoughts on what needs to be done?